Decorative Life: Weeks depending on use, but low light will result in foliage, not flowers. Member of the Verbenaceae (vervain family). Native to South America, in particular, Uruguay. Relatives include verbena, lemon verbena and clerodendrum. Flowers are small, in terminal rounded clusters up to 2 inches wide. Leaves are about 1 inch long, coarsely toothed, stems trailing, fragrant. Often used in hanging baskets. Flowers are not fragrant, only the foliage. The specific epithet name “montevidensis” means of Montevideo, Uruguay, from which it came. 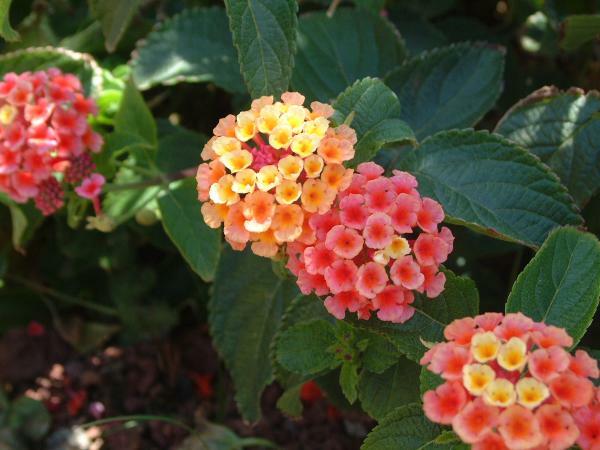 Lantana, an old name that also applied to the genus Viburnum. Most foliage is very fragrant when touched. Will generally do well in light levels at least bright enough to read a newspaper in comfort but more light would be better. Mostly used in hanging baskets. Some favorite cultivars and their respective flower colors include ‘Patriot Desert Sunset’ (yellow, gold, peach, pink).